From September 25th to October 1st, authors, readers, publishers, and constitutional right advocates will celebrate books that have been banned for whatever reasons. This year, Banned Books Week is looking at diversity. Although diversity isn’t a new word, some may imagine diversity as a person of color. Diversity, however, includes people who are of different appearance, ethnicity, religion, gender and gender identity, age, physical and mental ability, sexual orientation, military status, and economic status. The American Library Association’s Office for Intellectual Freedom has shown that 52% of the books challenged or banned in the past 10 years were from diverse content (Association of American Publishers). Without diversity, there wouldn’t be an anime industry since anime and manga come from Japan. Did you know that Dragon Ball by Akira Toriyama is a banned book in the United States? Barefoot Gen by Keiji Nakazawa has been challenged–not quite banned but noticed–for its discrimination and violence. 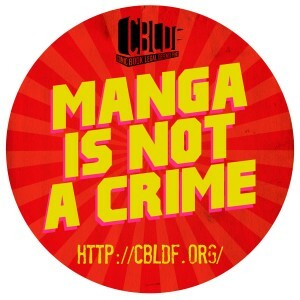 There are other manga and graphic novels by Japanese creators who have faced or are currently facing censorship around the world. Can you think of any others? I went to San Diego Comic Con this year after a 5-year hiatus (thanks, Japan) to find that the Comic Con I one loved has been hijacked by security–RFID security tags! You swipe them at the entrance and you swipe them when you exit. At least the energy of good ol’ geeks and nerds and everyone in between was still there. It just came with a lot of people. I couldn’t create a mental escape path without running into a billion folks and encountering some B.O. I thought I had gotten used to from years of convention hopping. 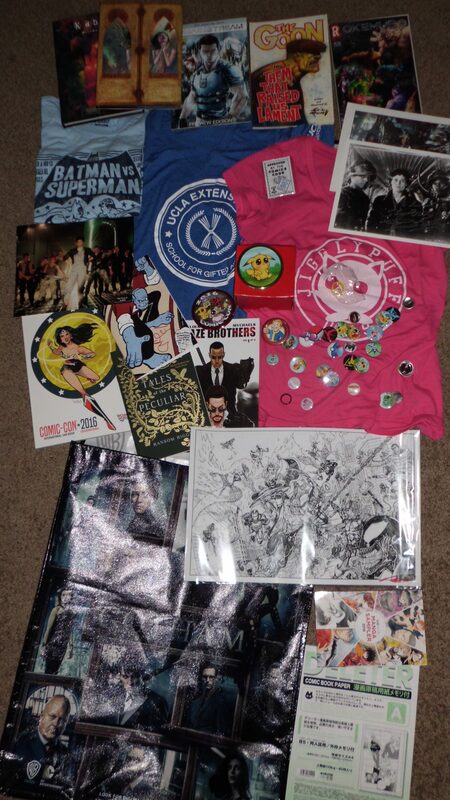 As much as Comic Con has a great freebie table, the star freebies were for attendees who made it to the registration entrance. After swiping past the security panels, attendees were given large plastic backpacks with choices between Pokemon, Gotham, Supergirl, and Comic Con themes. I chose Gotham, not because I was wearing my Batman shirt from Japan and not because I liked-loathed the first episode of Gotham, but because it was black and went with anything. Judge me if you like. I’m a black lover. While I was in the Sails Pavilion, I roamed the autographs section where actors from different TV shows, movies, and animated series met and greeted fans. I saw an Aliens poster and stopped to find Ricco Ross, or Private Ricco Frost, hanging out at his table with cool scenes from Aliens. I talked to him some time, got his autograph, and went back down to the main floor to finish looking for David Mack, the artist and writer behind Kabuki and several Daredevil comics. I found Mr. Mack after a beautiful woman in white took me to a table with 2 handsome brothers promoting their comic, Okemus, and their company, RAE Comics. From the past 7 Comic Cons I’ve attended, this was the first one where I saw many black comic creators as well as black companies with good promotion. On Sunday and the last day of Comic Con, I bought a few shirts and immediately donned a pink JigglyPuff shirt from the Mighty Fine brand since all the Pikachu shirts were gone (darn you, Pokemon Go!). It wasn’t as crowded as Saturday, mainly because most celebrities attended Friday’s and Saturday’s panels and promotional events. Sunday has always been the best day for Comic Con goers to buy their most-wanted merchandise at low prices. “Help us get rid of this extra inventory!” is the call of the last convention day. And if you’re a good haggler, this was the best time to haggle. I found manga priced down from $12 to $8 and Superman and Batman shirts discounted to $5. David Mack gave me a deal on two of his Kabuki volumes ($25 for two hardcovers signed), and I bought a hardback volume of The Goon. Promoters and creators were more visible between the aisles as they handed out the last of their free comics, wristbands, book samples, and stickers. I returned to the Sails Pavilion to find Ricco Ross again. We ended up chatting for about an hour about random stuff, some fans stopping in between our conversation, and he gave me some advice on life. I’m not into celebrities and movie stars, but I think Ricco Ross is one stand-up, down-to-earth guy. I’ll be looking for more of his roles on the silver screen. By 2:00 and after some impulsive buys, I left Comic Con to find some Pokemon outside the convention center. In the past Comic Cons, I had always felt like I had accomplished a big feat even when I had little money and couldn’t buy and go wherever I wanted. I survived the San Diego Comic Con! I would think as I rode the trolley to my car. Now that I have the time and money, I just don’t have the energy to be excited for hours on end. Thankfully, meeting fans and creators, exchanging cards with small press and independent publishers, and conversing with a talented actor made up for my low energy. Next year, I’ll be sure to prepare my heart–and maybe find a sturdier bag–so I can keep up with all that is the San Diego Comic Con.